• Streber’s Market, 299 W. South St., New Vienna, March 4. Follow-up. Eighteen previous violations corrected. InstaPot used for cooking hoagie meat not NSF/commercial. Lids missing on dumpster. Dust accumulated on ceiling at main walk-in cooler. Shelving in sales cooler has debris accumulations. Deli dept. corner trim on cabinet with hand sink not secure. Light bulb nonworking in light above reach-in freezer in deli dept. (ceiling). Grab-and-go cooler lights nonworking. Side of sales are platform needs sealed and cove trim installed. Old check lanes, deli cases, shelves, etc. stored outside next to building. Light bulb in deli cold case missing shield. • #1 China Buffet, 1587 Rombach Ave., Wilmington, March 5. Three previous violations corrected. Thank you. No employee currently has Class 2 certification. Employee still waiting for Chinese test availability. Wiping cloths on sushi prep counter and at cooking station in kitchen. Black and pink residue on outside of doors to walk-in coolers. Wall behind ice machine is dirty. Grout behind the spray sink and behind 3-compartment sink is dirty. Floors and walls in kitchen dirty and need to be cleaned. All non-food contact surfaces need to be kept clean. • Roberts Arena, 4095 SR 730, Wilmington, March 7. Follow-up. All previous violations corrected. Thank you. • World Equestrian Center, 4095 SR 730, Wilmington, March 7. Follow-up. Air gap is not right yet. Did put in new drain but piping down in tube. Please remove and add 1-inch air gap. • Brown’s Distributors, 100 E. Main St., Martinsville, March 7. Two previous violations corrected. Thank you! 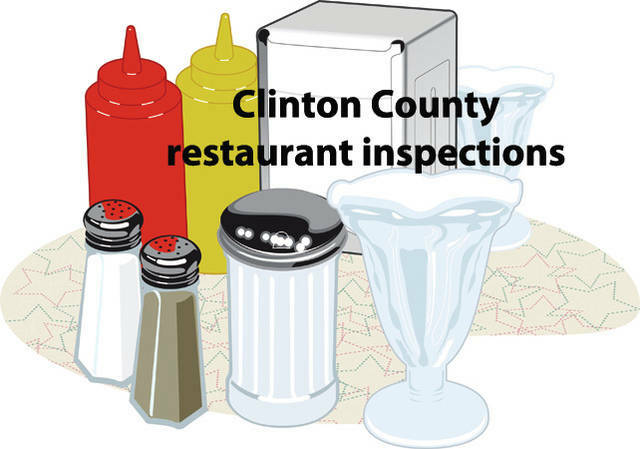 No one at the facility is Class 2 food safety certified; no evidence or certificate available. Floors cracked throughout kitchen and facility. No verification of fire inspection. Employee stated fire department had been there. Please provide Health District with copy of fire inspection. • Xenia Avenue Market, 659 Xenia Ave., Wilmington, March 7. Consultation. Currently operating without RFE license. Owner showed me check stub where he wrote check Feb. 4 and said it was mailed in. Called bank; they have not gotten check. Must pay with penalty fee by March 15 to avoid legal action. • Gold Star Chili, 942 Cherry St., Blanchester, March 7. Follow-up. Two previous violations corrected. Thank you. Critical: Foods in prep cooler on the line are not dated. Wire/metal shelves by dishwasher are rusted. Wall behind 3-compartment sink is dirty. Light out above hood unit. Counter under milk shake machine is not easily cleanable. Finish is coming off counter on make line. • Yamato Steak House, 1362 Rombach Ave., Wilmington, March 1. Follow-up. Calibrating solution for pH meter unavailable. Rice, white, for hibachi grill) 42-44°F with condensation within container. Discussed methods to cool rice quickly. thank you for correcting other violations.